An excellent way to increase your growing area or providing additional working surfaces if you're an industrious gardener. You'll find a choice of one or two tier staging in either aluminum or green. 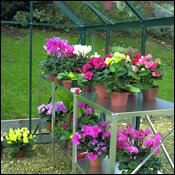 Benches & Shelves are the perfect addition for any greenhouse. You'll always be looking for ways of making extra space in a crowded greenhouse and the answer lies in using shelves and staging. Create the ideal maintenance-free workspace. The Importance of Shelving and Plant Holders: Shelving is a great way to maximize the space in your greenhouse and accommodate all of your plants. 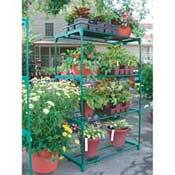 It is important for the air to circulate around the plants, so all of the tables and shelving we carry are slated. This style makes it easier for watering and clean up and your plants will thrive. Climbing vine plants, such as cucumbers and tomatoes, love the plant spirals. The spirals allow the plants to climb taking up less floor space and promoting healthier plants and vegetables. Finally, our plant rings allow you to hang your flowers from the roof of the greenhouse, utilizing every level of growing space. If space is an issue, build higher with our four-level bench! Fasteners to connect two or more units together are included. Can stand alone or be joined together for multiple units. Dimensions: 35"W x 19"D x 54"H.
Summer, fall, winter or spring... keep growing all year with our 4-season, 4-tier Mini Greenhouse! Use clear PVC cover with zippers to maximize light transmission. 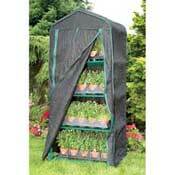 Greenhouse comes complete with 2 covers for year-round growing! Use 60% black knitted shade cover with zippers during extreme heat, to reduce and eliminate sun scorch and heat stress, and to ensure optimum plant health. Quick and easy assembly. 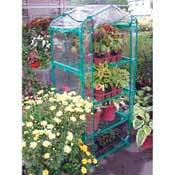 Dimensions: 27"W x 62"H x 19"D.
Garden Starter Greenhouse comes complete with shelving! Two tiers of shelving on either side easily accommodate your needs. Double-zippered front doorway provides easy access. Tubular steel framework snaps together quickly and easily. Velcro attaches UV-reinforced, PVC cover to the frame. 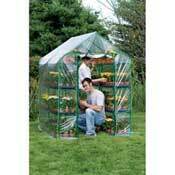 Dimensions: 4'6"W x 6'3"H x 4'6"L.
Extend your growing season or get a head start with our 4-tier Mini Greenhouse! Clear vinyl cover with zippers.